A seminal force in the history of MCYO, Olivia W. Gutoff, Artistic Director Emerita of the Maryland Classic Youth Orchestras and Philharmonic Conductor, passed away on Wednesday April 10. Her legacy lives on in the hundreds of musicians’ lives she has touched and in this organization, which she raised to great heights until retiring during the 2006-2007 season. 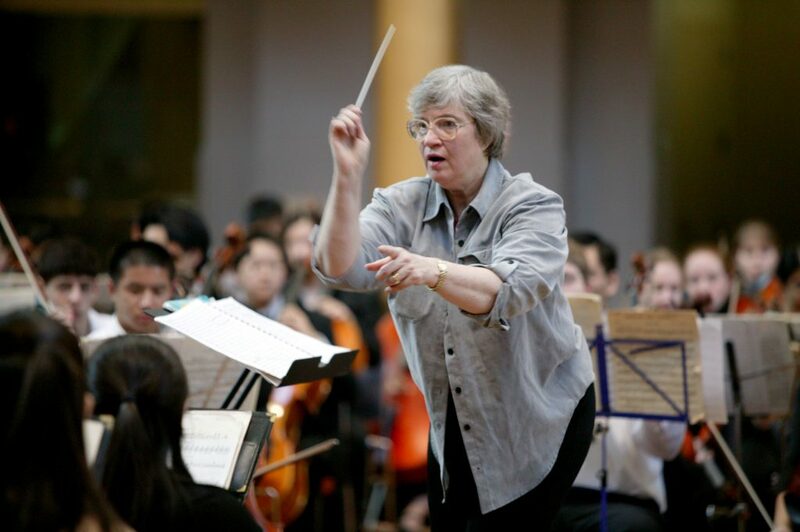 Having served the organization devotedly for 25 years, the last 12 as Artistic Director and Philharmonic Conductor, it was her leadership, vision and commitment that sparked tremendous growth in the entire MCYO organization and which brought MCYO into its new home, The Music Center at Strathmore, where it resides today, now as a program of Strathmore. Mrs. Gutoff was regarded as one of Maryland’s premiere conductors of young instrumentalists. She was praised nationally for her devotion to music education, her standards of excellence, and her mentoring of young musicians and teachers. 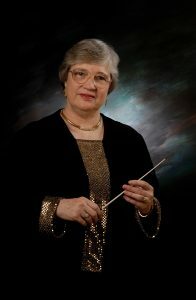 She served in many leadership positions in the field of music education, including the Maryland Orchestra Director’s Association, the Maryland Music Educators Association, the Maryland Band Director’s Association, and on the board of the Youth Orchestra Division of the League of American Orchestras. An outstanding French Horn player and teacher, Mrs. Gutoff performed with the National Symphony Orchestra, the Washington Opera Society Orchestra, the Kennedy Center Ballet and Show Orchestras, the National Gallery of Art Orchestra, the Wolf Trap Filene Center Orchestra, as well as the New York City Opera Orchestra, the New York City Ballet Orchestra, and the American Ballet Orchestra and the National Philharmonic. “The past twelve years as Artistic Director and Philharmonic Conductor have been rewarding. To be an educator, professional musician and music teacher, and be the conductor of the MCYO Philharmonic is having the best of all possible worlds. Truly a life-force, Mrs. Gutoff was an exceptional woman who impacted the lives of countless people and made her mark on this organization. The mission of the Maryland Classic Youth Orchestras is to nurture, develop and advance young talented musicians in a quality orchestral program. The Maryland Classic Youth Orchestras (MCYO) program strives to create a seamless connection between the artistic and the educational experience. MCYO now enjoys its first permanent home in the grand Music Center at Strathmore. MCYO is highly regarded regionally and nationally as one of the country’s most outstanding youth orchestra programs. Founded in 1946 as the Montgomery County Youth Orchestra, MCYO is the oldest and most established youth orchestra program in the Washington, DC metropolitan area. Since 2005, MCYO has been a resident partner in the beautiful and world class venue at the Music Center at Strathmore where it has been thrilling audiences with artistic performances from all age levels. Under the direction of MCYO Artistic Director Jonathan Carney and MCYO Music Director Kristofer Sanz, MCYO proudly ushers in its 73rd season of providing a quality orchestra program for the area’s young talented musicians. The Music Center at Strathmore is regarded for having one of the most beautiful and acoustically desirable concert halls in the world. The center also boasts an education center with offices, studios, and rehearsal suites to support unprecedented partnerships between Strathmore, the Baltimore Symphony Orchestra, Washington Performing Arts, National Philharmonic, Levine School of Music, and CityDance Ensemble. MCYO offers three full orchestras, a chamber ensemble, three string orchestras, small ensembles and chamber groups to over 500 talented musicians in grades 2-12. Auditions for MCYO are held annually in late August.